One night while performing on stage, I was struck with an unexpected epiphany when the rustle of an audience member unwrapping a candy crackled in the stillness. This is a familiar sound to theatre performers and patrons alike. It’s recognized and then dismissed into the commonplace din of many subtle theatrical sounds – but sometimes that particular noise will seem endless. In all my years of hearing that unmistakable sound, I never connected it to the pain and inflammation of arthritis until I was diagnosed. Years before my own diagnosis, when I thought of the challenge of living with arthritis, I envisioned the more obvious features of the disease – walkers, canes, crutches, braces and wheelchairs. I didn’t understand the impact of arthritis on the smaller joints, and how it much it can change the way we deal with simple daily tasks until I experienced it myself. One of the liberties I had taken for granted was the use of my hands. It didn’t occur to me that I would have to deal with weak, swollen and painful hands at such a young age. Now admittedly, I have never been the most graceful of creatures – I frequently dropped things due to a natural impatience, but I certainly noticed a marked increase in dropping, gripping and difficulty with opening things after I was diagnosed with RA. An editor I had the pleasure of working with posed this question: she had bought a wrapped lettuce head from the store and had some difficulty removing the cellophane wrapping from around its plump bulk. If she had this much trouble without arthritis, she wondered how difficult would it be to a person with arthritis? 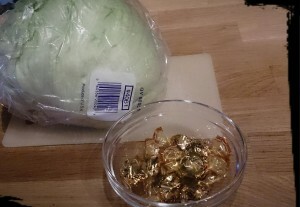 And so, I went out and deliberately bought a wrapped head of lettuce to test this theory and discovered just how difficult it was for me to remove it from its packaging. Here is my guest post for Creaky Joints, where I write about the “simple things” I never anticipated in the midst of RA. So true. The most humiliating thing for me was having to ask one of my nurses to open my bottle of lemonade. I could not grip, even if I could tolerate the pain of gripping the cap, I could not physically apply enough pressure to twist the cap open. The nurses were happy to do it, but I was unhappy to have to ask. Such a simple thing can bring you to your knees. Now the days that I can twist open the caps of my bottle of green tea, without the help of a rubber gripper thingy, are days of victory! I fumble so much these days with all the little things. My independence and, well let’s face it, pure stubbornness will usually result in me fighting with opening anything before I give in and reluctantly ask my better half for his help. I have to invest in a new type of rubber gripper as the one I have has stopped gripping. I guess even it has its bad days 🙂 Wishing you well. X.
Oh, yes, every time I go shopping I have to remind them that I’m walking and please don’t fill one bags with all the heavy items. I hope your cart will remain balanced for a good long time. Wishing you continued wellness. X.